The pool is a 20ft x 10ft wedge type pool and when we started stripping back the existing pool we were surprised to find that the actual pool structure was made of steel. As the property had previously had some agricultural use we assume that an innovative farmer had utilised the steel tank in order to provide a pool for his family. On inspection we were happy to discover that the steel structure was intact and useable. 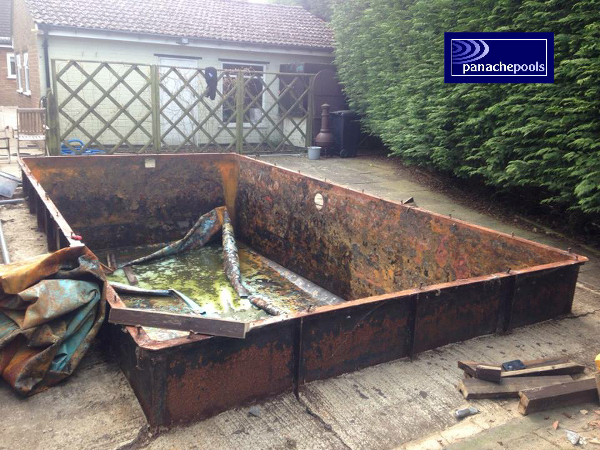 We treated the steel tank and lined in completely in underlay. We replaced all the pool fittings and light and added a suction inlet to improve water flow / filtration. We supplied a new bespoke 30 thou plain blue liner with mosaic tile band from Plastica. New Plastica stainless steel steps and plastic premium reel and cover. Plastica Heat Pump and Endurance Filter / Pump pack with back up Elecro heater. We also fitted a Badu Jet counter current unit to pool to enable ‘endless swimming’ without the need for turning when swimming. In order to achieve an attractive finish we cloaked the ugly steel tank that was visible above ground in an attractive cladding. 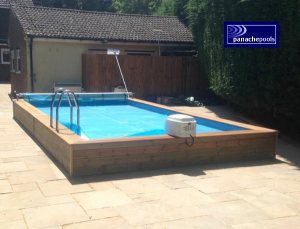 This gave the appearance of the finish on our popular wooden pool installations. We achieved this by constructing a timber stud frame around the pool which we then cladded using pressure treated, tantalised timber decking. We then fixed a hardwood timber deck to form the top pool coping. 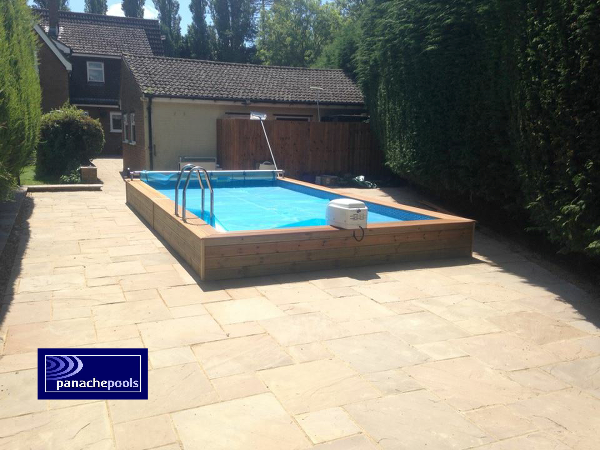 We also laid a new paved area and pool surround using Natural Stone Paving. 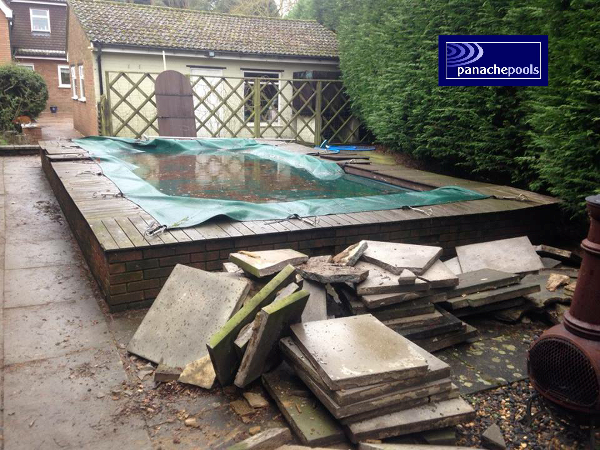 The project will be complete when we fit a new IPC telescopic pool enclosure which will provide the perfect combination of an indoor / outdoor pool. Our delighted clients now have an all year round exercise pool to share with family and friends. During the summer months the telescopic enclosure can be opened up allowing the swimmers to soak up the sun’s rays while in the pool. As you can see in the pictures, the new pool is virtually unrecognisable when compared to the old pool and we hope this successful restoration project goes some way to show what is possible even if your pool has suffered years of neglect.